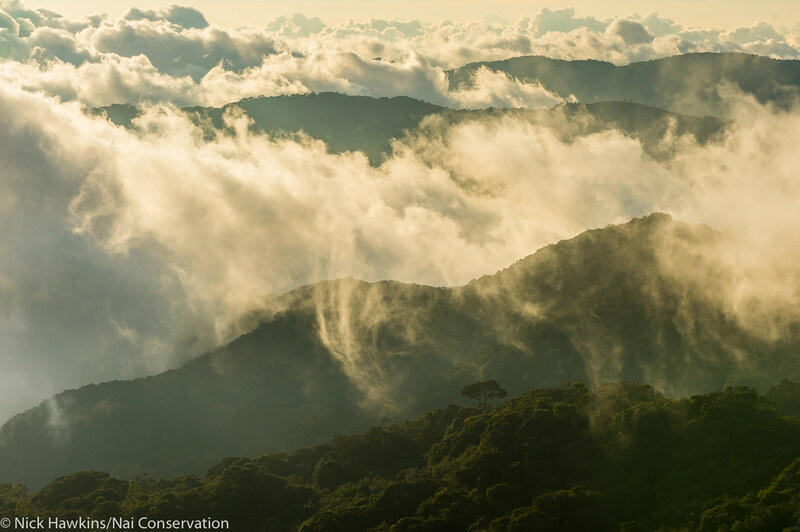 In the highlands of southern Costa Rica lies an extraordinary place. Away from the tropical beaches and steaming jungles, to walk into the mountains of the Cordillera de Talamanca is to enter another world. Mountain peaks soar over 3,000 meters, covered with mist-shrouded cloud forest, contorted stands of oak trees and sweeping high-altitude tundra. During the day, the sun glitters in an azul sky as clouds form a brilliant white blanket over the hills below. At night, the cold creeps in as frost crystalizes the leaves and silence falls like a cloak. In this mysterious world, hummingbird and quetzal calls echo throughout the forest, Coyotes and Pumas prowl the trails at night and the largest mammal of the neotropics reigns. Baird’s Tapir thrive here in one of the last remaining extensive populations. Thanks to a network of protected areas and forest reserves, tapirs and other animals can wander freely over hundreds of miles in an area that spans southern Costa Rica and northern Panama. But even in this pristine wilderness, tapirs are under threat. Cutting through this wilderness is a landmark of human engineering—the Pan-American Highway. This single feat of construction has the power to limit the population of this incredible animal. Machines that were invented just over a century ago are colliding with a mammal that evolved over millions of years in their absence. As tapirs cross this stretch of asphalt that runs from Alaska to Panama, they are in danger of collisions with the vehicles that speed along it. All too regularly, park rangers come across the broken bodies of tapirs who failed to safely reach the other side of their mountain home across the road. As the global population of Baird’s Tapir dips below 5,000 individuals, each animal counts. As such, the group Nai Conservation is doing everything it can to combat the threat facing tapirs in the Coordillera de Talamanca. Beginning in 2015 the group initiated a project to understand the population of tapirs in the region in order to find solutions to the issue of vehicle collisions. In 2016, Nai Conservation began deploying remote cameras in the region of forest surrounding the highway. Their aim—to understand what drives which parts of the forest that tapirs are more likely to occupy and as such, where they are more vulnerable to collisions with vehicles. To date they have set 45 camera stations over the entire 324km2 where the road bisects the forest. Over the coming months they will be retrieving these cameras, setting them in new locations and ultimately, revealing new insights into this hitherto understudied population. Traveling to these stations is no easy feat. The team must navigate its way through tangled vegetation, hacking with machetes to create paths where there are often none. When the weather closes in, the conditions can be brutal, with rain soaking skin and cloud obscuring vision. But when the skies are clear, the mountains are magical. With not a soul around for miles, this is a chance to experience true wilderness. Hundreds of species of birds dart between trees, some found no-where else on earth. Tracks reveal the presence of puma, peccaries, Jaguarundis and Ocelots. But it is the tapirs that leave the most conspicuous signs. Huge three-toed tracks are embedded in the mud, bark is stripped away from certain trees, their droppings are left in communal latrines and strangely human-like trails are maintained throughout the forest. All these signs help the researchers decide where to place their cameras. Amongst the beauty of the mountains is a sense of eeriness. When darkness falls at night, it is all too easy for the mind to dwell on the tales locals tell of the things said to inhabit this place. Small elf-like beings create mischief, witches search out victims and ghosts haunt areas where locals prefer to avoid. And it is perhaps fitting that such a mysterious animal should inhabit such an otherworldly place. In many cultures, including the BriBri community who call these mountains home, the tapir is a creature of a parallel world able to move between ours and the next. But sadly, though they may be able to move between dimensions, the stark reality is that tapirs are no longer able to safely move through the mountains they have called home for millennia. Nai is determined to combat this. They are working to ensure changes are enacted so that the mountains will always be home to the tapir. You can assist Nai by contacting them at naiconservation@gmail.com or follow their updates on Facebook and Instagram at naiconservation. Laurie Hedges is a research consultant, videographer, field worker and Nai Conservation team member.